Obviously the key to success is to be a Greek god or goddess. Long after the gods and goddesses of mythology stopped being worshiped, their legacy (and your struggle to remember your grade school mythology lessons) lives on. There is something about your first stop on a vacation. You've just arrived in a new place. Then you see that one thing that lets you know that you're not in Kansas (or Colorado) anymore. Even if you had to fly back home the next day, you could say "Yes, I've seen the _______." We didn't arrive in Athens until late on a Sunday night. The airport is modern. The interstate is modern. Other than Greek on the signs, you could be anywhere. Then you get to downtown Athens. The temple of Zeus is lit up. The Acropolis is lit up. And you know you've arrived. In history. In the AA (authentic ancient). 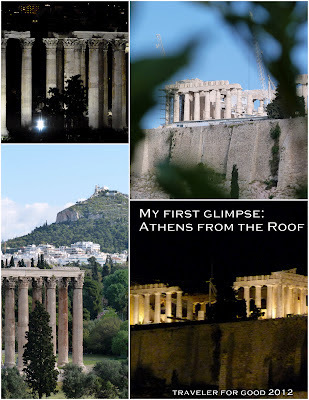 These photos were taken from the rooftop terrace at the Royal Olympic Hotel, our home away from home on two occasions during our vacation. To be sipping coffee or a cocktail overlooking history...it's awesome.